Establishing a healthy work-life balance is hard, and ironically, finding ways to squeeze in de-stressing hobbies can be extremely stressful. Over the years, John Froehlig, a graduate student in the Program in Molecular Biophysics, has perfected the art of making progress on his thesis without sacrificing his other passion: music. 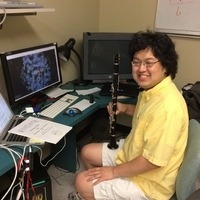 John Froehlig analyzes a protein structure with music never far from his thoughts. Froehlig joined Johns Hopkins in 2010 and studies proteins implicated in multidrug resistance under the direction of Herschel Wade, Ph.D. He made the move to Baltimore from Iowa, bringing with him a musical history dating back to fifth grade, when he first picked up the clarinet. Over the last 16 years, he’s added numerous instruments to his repertoire and has spent over 12 years arranging original pieces. Music has always played a role in Froehlig’s life and was something he was unwilling to give up while pursuing his doctorate. After an unsuccessful audition with the Johns Hopkins Symphony Orchestra, Froehlig continued his search for a band in the Baltimore area. In 2011, he came across the Johns Hopkins Wind Ensemble. This organization is under the direction of doctorate students at the Peabody Institute, is open to all Johns Hopkins students and staff, and doesn’t require an audition. His musical inklings still unsated, Froehlig successfully auditioned for the Johns Hopkins Jazz Band a year later and has been an active member of both bands ever since. That seems like a hefty commitment, but one of the great things about the ensembles is that they’re sustained by student participation. That means rehearsals are typically only twice a week and are in the evenings to avoid class conflicts. Froehlig has found this makes fitting in a full day in lab fairly easy before he switches out his scientific instruments for his musical ones. The days he has rehearsals might be tiresome, but the benefit of participating in these groups exceeds just letting him enjoy his musical hobby. Music helped Froehlig find a comfort zone in Baltimore, which has allowed him to meet fellow students who share his passions for research and the arts. Both bands occasionally showcase original work written by students, which has introduced Froehlig to numerous musical styles beyond those of the classic composers. He has also found that “the stresses of lab and classes are mediated by playing music,” which has helped him cope with the anxiety that follows those all too common moments when experiments simply won’t work. There is also a hidden benefit to continuing his pursuit of music that has aided his graduate work. One Comment on "Graduate Student Finds a Harmonious Work-Life Balance with Music"
Sharing this wonderful article in hopes that it will positively influence other students.